Although this is perhaps not the CD for lovers of pure-drop traditional music, I must confess being a big fan of Cormac's whistle playing and of his recordings with the group Deiseal, on which, with the help of Niall O'Callanain and Paul O'Driscoll, he fused traditional music and jazz in a very convincing way. 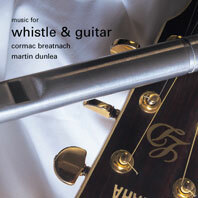 This CD very much follows on the same path, this time in partnership with the excellent guitar player Martin Dunlea. Traditional and original tunes are played in traditional style, with Cormac's amazing variations, and interspersed with jazzy improvisations, the whole flowing together quite well.